That rare and beautiful thing: an intelligent show about cooking. This Emmy and James Beard Award-winning series combines travel, cooking, history, science, and humor into an unforgettable journey. Join executive producer and narrator Anthony Bourdain as he takes viewers inside the mind of noted chef and restaurateur Magnus Nilsson. 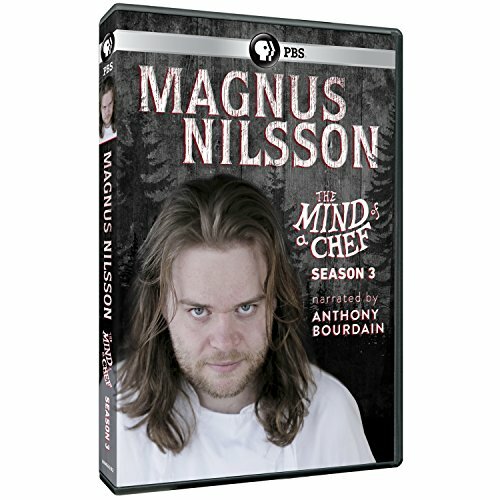 Arlington, Va. - November 14, 2014 - PBS Distribution announced today it is releasing Mind of a Chef: Magnus Nilsson on DVD December 9. "The Mind of a Chef" is that rare and beautiful thing: an intelligent show about cooking. This Emmy and James Beard Award-winning series from Zero Point Zero Production combines travel, cooking, history, science, and humor into an unforgettable journey. Join executive producer and narrator Anthony Bourdain as he takes viewers inside the mind of noted chef and restaurateur Magnus Nilsson. In Jaemtland, northwestern Sweden, about six hours north of Sweden's capital, the land is isolated, sparse and frozen half the year. It is in this isolated landscape that Chef Magnus Nilsson has transformed a ski resort farmhouse into what some say is one of the best restaurants in the world, with a several month long wait list. Guests at the 12-seat Faeviken Magasinet restaurant are treated to a multi-course, inventive, perfectly timed and choreographed meal prepared by Nilsson and his small kitchen staff. The menu boasts seasonal ingredients that honor the landscape of the region as well as championing the traditions and past of its people. The small team of chefs who work with Magnus at his restaurant Faeviken harvest and preserve all the food for the restaurant use the most natural methods possible. They reject the popular contemporary cooking equipment such as low-temperature water baths and liquid nitrogen in favor of simple cooking methods of grilling and roasting over open coals, relying on the chefs' innate skills and knowledge of the product to get the perfect result. Eight half-hour episodes take viewers into Magnus Nilsson's meticulously planned and executed kitchen at Faeviken for an all-access look at what it takes to run, manage and maintain standards at what some people say is the most creative and surprising restaurant on the planet. Chef Nilsson will also return to Paris and explore how his early cooking experience has influenced him, focus on local ingredients in his Scandinavian homeland Sweden and nearby Norway, show us how to make the most of ingredients at their freshest and preserving them in creative ways, and head deep into the Atlantic ocean to explore traditional Nordic culinary techniques in the Faroe Islands. Mind of a Chef: Magnus Nilsson will be available on DVD December 9. The run time of the DVD is approximately 240 minutes and its SRP is $24.99. The third season of "The Mind of a Chef" consists of 16 episodes, with eight featuring Edward Lee and eight featuring Magnus Nilsson. "THE MIND OF A CHEF: EDWARD LEE" will be available on DVD from PBS Distribution September 30, 2014. Season one of "The Mind of a Chef," which features David Chang, is currently available on DVD from PBS Distribution for $29.99. Click here to view the preview of season one. The second season of "The Mind of a Chef" is presented on two DVDs - "The Mind of a Chef: Sean Brock" and "The Mind of a Chef: April Bloomfield." Each DVD is available for $24.99. Click here to view the preview of season two. Chef Magnus Nilsson moved abroad to France after cooking school, working with such greats as Pascal Barbot at L'Astrance and was inspired by France's expansive culinary culture. Years later after returning home to Sweden, Nilsson nearly gave up cooking altogether due to limitations on quality of Sweden's produce and ingredients. Magnus turned to wine and decided to pursue a career as a sommelier, eventually assembling a wine cellar for the owner of the Faeviken estate in Jaerpen Sweden. Drawn back to food, he eventually became the head chef at Faeviken, and since has made it a point to work with the confines of the seasons of Northern Sweden, whether it be fishing and hunting nearby or harvesting and preserving produce. Naturally, this creates a unique and ever-changing menu indicative of the Scandinavian terroir. Magnus has been featured in the Wall Street Journal and the Guardian, and his cookbook Faeviken was released by Phaidon in 2012. His restaurant was just recently ranked 19th on The World's Best 50 Restaurants List. About Zero Point Zero Production Inc. Zero Point Zero Production, Inc. is a television and digital production company founded in 2003 by Executive Producers Chris Collins and Lydia Tenaglia, with partner and Managing Director Joe Caterini coming aboard in 2009. Since its inception, the company has produced hundreds of hours of television in over 90 countries around the world, including the four critically-acclaimed and Emmy Award-winning series, Anthony Bourdain: Parts Unknown (CNN); Anthony Bourdain: No Reservations (Travel Channel); Diary of a Foodie (PBS); and The Mind of a Chef (PBS). In 2009 Zero Point Zero began an expansion into other content platforms including interactive entertainment and publishing. In 2012 they released Pat LaFrieda's Big App for Meat, an interactive encyclopedia chosen as Apple's "App of the Week" and then named one of Apple's "Best APPS of 2012." In 2013 ZPZ acquired the Food Republic website, one of the launch properties in a new ZPZ-owned digital publishing venture. Other digital projects include branded content for Subaru, Microsoft/BING, TUMI, Weston and Breville. ZPZ has produced original content for CNN, PBS, Discovery Channel, HLN, History Channel, and Travel Channel and is currently in production on Anthony Bourdain: Parts Unknown (CNN); The Hunt with John Walsh (CNN); City.Ballet (a co-production with Sarah Jessica Parker/Pretty Matches for AOL On Originals); the two award winning series, The Mind of a Chef (PBS) and MeatEater with Steven Rinella (Sportsman Channel); and The Getaway (Esquire/NBC). PBS Distribution is the leading media distributor for the public television community, both domestically and internationally, extending the reach of these programs beyond broadcast while generating revenue for the public television system and our production partners. PBS Distribution offers a diverse range of programming to our customers, including Ken Burns's films, documentaries from award-winning series such as NOVA, FRONTLINE, AMERICAN MASTERS, NATURE, and AMERICAN EXPERIENCE, dramas from MASTERPIECE, as well as films from independent producers and popular children's programming. As a multi-channel distributor, PBS Distribution pursues wholesale/retail sales, consumer and educational sales through PBS-branded catalogs and online shops, and international broadcast and video sales. PBS Distribution is also a leader in offering programming through digital platforms including internet and mobile devices.